The art of listening is a skill that can be achieved. Many young people in our noisy world have formed the habit of “turning off” the attention to the sound. They don’t make any effort to distinguish the sounds and therefore block themselves off and lose many learning activities. Listening with attention is vital for learning the sounds of the letters in the reading section. 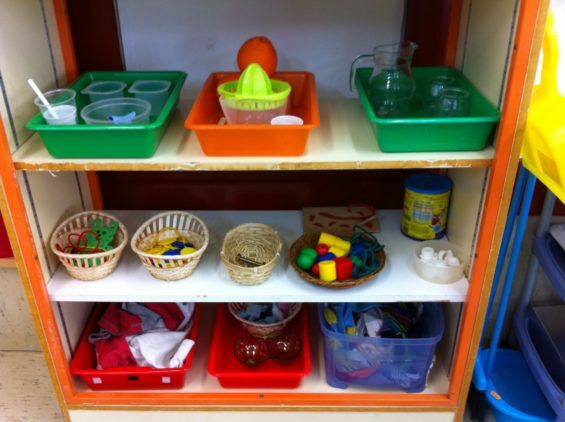 Montessori designed several sensory games to help the child to focus on particular sounds. In a game, the child is blindfolded and asked to identify the particular classroom sounds, like the noise of a window opening, a closing door or pour water. In another match, it aims to identify the voices of their classmates without looking at students who are talking. To help children become more aware of the intensity of the sound, Montessori designed a set of six cylindrical wooden boxes with red lids. Each box contains a small amount of different substances: salt, rice, dried beans, buttons or pebbles. Different sounds are produced by the child when he shakes the boxes, and it varies in intensity from mild to strong. There is a second set of boxes with blue lids. Each box in the first set has a companion in the second, which produces a similar sound. The child (by listening) must find the couple. Then, he can put the boxes in a set from the strongest to the softer. For the next step, the child can use a box containing eight different color tones. The tones of each color are classified from very light to very dark. For this exercise, the child should distinguish the intensity of the tones and set tablets in order from the lightest to the darker shade of each color. 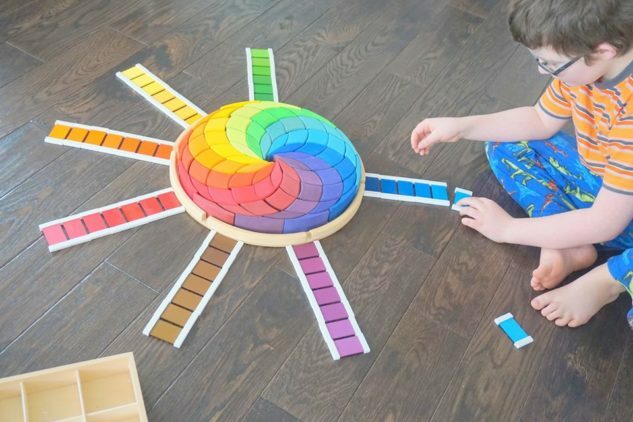 When the exercise is completed, the arrangement of colors gives a beautiful rainbow that is attractive for the children effect. The professor can make this activity even more difficult. He can select a color tablet and ask the child to go to the box and bring back the tablet that is darker or lighter than the master is holding. It is not easy for them, but many children are able to do so with accuracy after working with colors for several months. Teaching children to be aware of the fine differences in colours gives them preparation for all types of scientific observations, the art and the appreciation of art, decoration, and many other meaningful activities. Smelling material consists of two groups of small jars with removable caps. These bottles are identical in all respects except the aroma containing. One contains cinnamon, other mint, coffee, cloves, etc. Each bottle has a peculiar fragrance. The food is covered by gauze or perforated so that the child can smell it but can not see it or feel it. Each bottle in the first set has a companion in the second set. The child combines the pairs smelling carefully each jar. The teacher uses this exercise as an opportunity to build vocabulary teaching him the names of the food they are smelling. In a parallel exercise, children smell cotton swab dipped in liquids such as perfume, vanilla and vinegar. Many teachers continue this exercise carefully so that children smell flowers in the garden of the school. Some children, blindfolded, learn to identify many of the flowers for their fragrance. 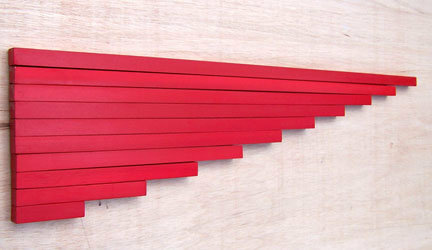 Red bars help children to recognize the differences in size and length. The child must place the bars in the proper sequence from the shortest (ten centimeters in length) to the longest (one meter). The exercise shows very clear the error in the order, so the child can be easily corrected. It also gives the teacher the opportunity to introduce the child to the terms: short, short and long, longer. This material will provide a child a sensory basis for learning that will be very useful for mathematics. This distinction can be illustrated by looking closely at two people who shovel the sand on a beach on a hot day. One of them is a man who is trying to fill a large barrel with sand; the other, a little boy, who is filling a bucket with sand, pouring out, and then filled again. If someone offers to help, the man gives easily on the blade; but that is different with the child. He clings to his shovel because the work he is doing can be done only by himself. By constant repetition of movements, he is strengthening muscles, improving coordination and gaining confidence in a particular skill. Nobody says he has to shovel the sand; the direction is guided by deep in his own nature. 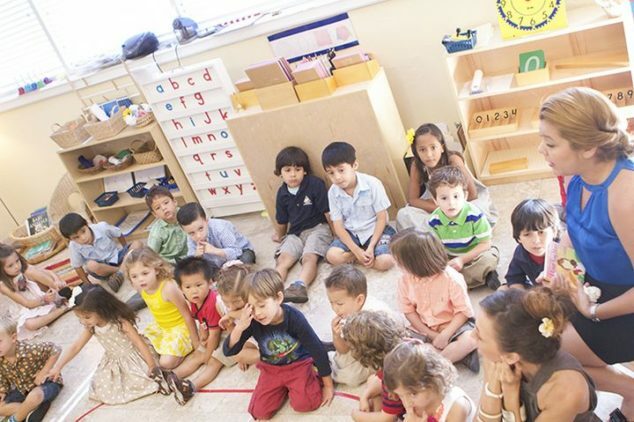 About the use of the natural inclinations of the child as a starting point, Dr. Montessori structured several exercises for the classroom to help children meeting their need for meaningful activity. For these exercises she used familiar objects such as buttons, brushes, plates, jugs, water and many other things that the child recognizes from experience in the house. For young children there is something special about the tasks that an adult considers ordinary: washing dishes, cut the celery and polishing shoes. These tasks are very interesting for children because they are the ones that allow you to imitate adults. Imitation is one of the strongest impulses of children during their early years. Several practical life exercises involve the use of water, the element that most children naturally like to play with. Bring the water in a jar and pour it into a basin helps children improve their coordination. As the child becomes absorbed in an activity like cleaning a table his range of concentration is progressively stretched. He also learns to pay attention to details and following a regular sequence of actions. Finally, he learns good work habits when he finishes each task and keeps all the material before starting another activity. 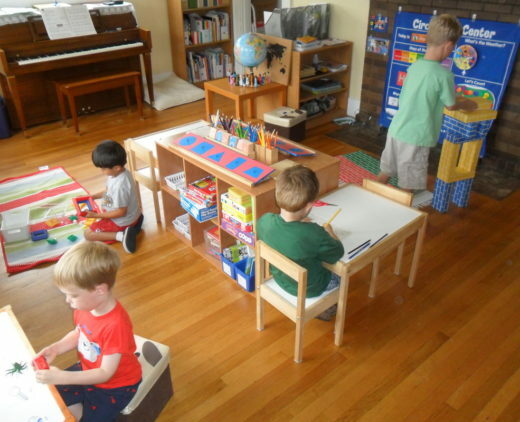 Although practical life exercises may seem simple and common, in fact they are a very important part of the Montessori program. Each of the tasks helps the child to perfect his coordination in order to be able to work with more complex academic subjects. Learning does not take place without concentration and attention. The child prepares himself to learn by performing exercises that help to gradually lengthen the time where he can focus his attention on a specific activity. Individual use of materials permits a varied pace that suits many skill levels in the classroom. A child younger or slower can work for many weeks on the same computer without affecting other members of the class. Advanced children in the same room can be moved from one piece of equipment to another very quickly, avoiding the boredom of waiting for others to catch up. Children with a high level of skill are constantly challenged by the wide variety of materials and its many uses. It is a well established fact that children mature at very different rates and periods of preparation for academic subjects vary widely. Since the interest is stimulated and materials are at hand whenever a child is ready, some youngsters in a Montessori class begin to read and calculate at an unusually young age. However, early learning is not the norm, nor was never the aim of Dr. Montessori. His only dream was that the learning experience should occur naturally and joyfully at the right time for each individual child. “It is true, we can not take a genius;” Dr. Montessori once wrote, “We can only give each individual the opportunity to fulfill their potential to become an independent, safe and balanced human being.